In a companion paper [DeYu] we have developed the tool of non-interactive proof-system we call “Metaproof” (μ-NIZK proof system); this provides a proof of “the existence of a proof to a statement”. Using a reduction of the theorem to a set of claims about encrypted values, enabled us to develop a crucial proof-system property which we called “on-line simulatable NIZK proof-system”. This was used to implement the “Many-Prover Non-Interactive Proof-System” where independent users can send proofs (which was not known in the original system and was open), and a “Self-Referential NIZK proof system” where the random reference string is available to the polynomial-time opponent who chooses the theorem to prove, (this was an intriguing question regarding such systems). In this abstract we present an introduction to the basic tools and their possible applications. 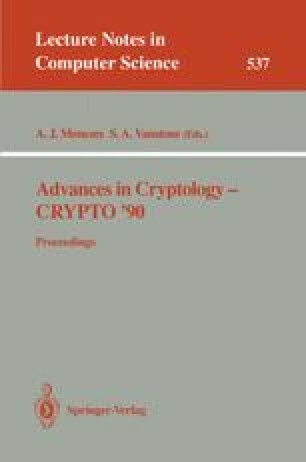 The subject of this paper is a variety of cryptographic applications provided by the new tools. We demonstrate its applicability in enhancing security and properties of a methodology for signature and authentication developed by Bellare and Goldwasser [BeGo] (by using the Metaproof system to solve the open problem of many-prover NIZK system). We also show, among other things, how the tools can be used to provide security mechanisms such as an “Oblivious Warden” which translates non-interactive proofs to random ones independently of the proof itself, and the notion of “Gradual opening of a zero-knowledge computation” which is first demonstrated to be correct using a non-interactive proof, and then is opened gradually and fast (i.e., without further proofs). Part of this work was done while the author was visiting IBM Research Division, T. J. Watson Research Ctr, Yorktown Heights, NY 10598.